It was the famous flight for peace to Scotland which went down in history and landed a high-tanking Nazi in jail for nearly five decades. Today marks 75 years since Adolf Hitler’s deputy Rudolf Hess set off from wartime Germany to seek peace with Britain before parachuting out of his Messerschmitt Bf 110 near Ayr. Hess had been attempting to locate Dungavel House at the time, believing the young Duke of Hamilton would be able to negotiate peace terms between the Nazis and the British Empire. But the British refused to hold talks, and locked up the prominent Nazi until after the war, when he was returned to Germany to face justice at the Nuremberg Trials of major war criminals in 1946. Still in custody in Spandau, he committed suicide in 1987 at the age of 93. Now, three-quarters of a century later, the Duke’s son James Douglas-Hamilton, Lord Selkirk of Douglas, has spoken about his father’s connection to the famous case. 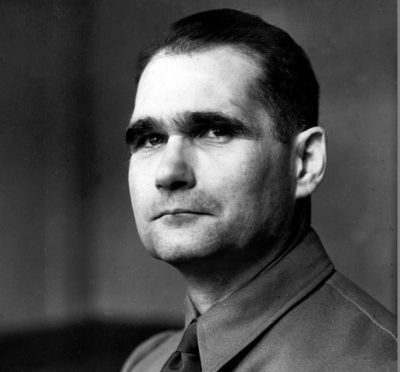 The Tory life peer wrote “The Truth About Rudolf Hess” in 1971 and this year will add a new foreword to the book with what he has learned in the intervening decades. Yesterday, the 73-year-old described his father’s “shock” at being picked by the prominent regime member to be targeted for the peace talks and said Hitler had been unaware of his approach. He said: “He and my father had never met before the war, he admitted in Spandau, but he had admired his skill as an aviator and realised that Germany couldn’t win a war on two fronts if they invaded Russia. “Hess had ambitions to be treated like an ambassador and be taken to the King. “What he didn’t seem to realise was that the British regarded Hitler as Satan’s representative on earth and were determined to fight the war. Mr Douglas-Hamilton still feels that the would-be peacemaker Hess was part of an “evil regime”. He said: “I think he represents an evil regime and had an active hand in signing all the anti-Semitic legislation that helped ultimately lead to the gas chambers.